XCP's webspace has been revamped and the journal will be posting (with some regularity) complete writings and excerpts from the journal's nearly 15 year history of continuous publishing. Thanks, everyone, for continuing to submit work, subscribe, and read the amazing writing that continually fills the pages between the covers of XCP. Remica L. Bingham is currently the Competency Coordinator at Norfolk State University in Norfolk, VA. She earned an MFA from Bennington College and is a Cave Canem fellow. Among other journals, her work has been published in New Letters, Callaloo, and Gulf Coast. Her first book, Conversion, won the Naomi Long Madgett Poetry Award and was published by Lotus Press. A book of her selected poems, The Seams of Memory, will be translated into Arabic and published in 2010 in conjunction with the Kalima Project. Bingham appeared on the panel Reclamation, Celebration, Renewal, and Resistance: Black Poets Writing on the Natural World during Split This Rock Poetry Festival: Poems of Provocation & Witness 2010. 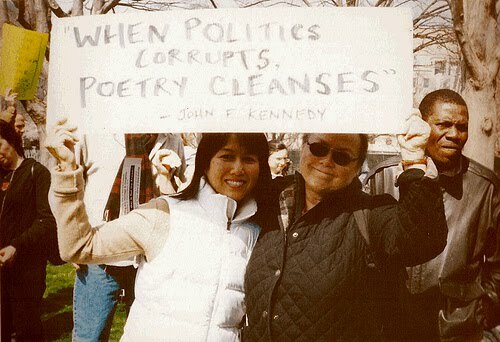 In 2003, poetsagainstthewar.org drew thousands of poems within days. In 2008, with no end in sight to the war in Iraq, activist poets gathered at Split This Rock Poetry Festival in Washington D.C. They came from across the country, a national network of writers for change, with readings by such poets as Sonia Sanchez, Patricia Smith, Martín Espada, Naomi Shihab Nye, and Carolyn Forché, among others - many of them contributers to this anthology. As to the question of the taboo against social action writing or "political writing: some writers inhabit a privileged realm that leaves them free to reflect on the perfect hurricane or a new hummingbird's nest. Other writers' realities reflect on the aftermath of the hurricane. It is the need to privilege those alternate or non-mainstream realities now that compels us to name social action writing as a literary movement. Sure, raising taxes for this reason is in my self-interest. I'm a business owner in this city, and I want more customers to have money to spend at my restaurants. Having a city with a widening gulf of haves and have-nots simply doesn't bode well for my long-term business plans. My personal stake in this doesn't end there. One of the proposals I support is raising the income tax on the top 5 percent of earners in the city. I fall into this category, and I'm happy to tell the D.C. Council that I'm not about to move to Bethesda or Fairfax if it takes this step. My family certainly isn't going to leave behind our friends, neighbors, doctors, etc., just because of a half-percentage increase on our income taxes. I love this city and want all its residents, not just a few, to prosper. 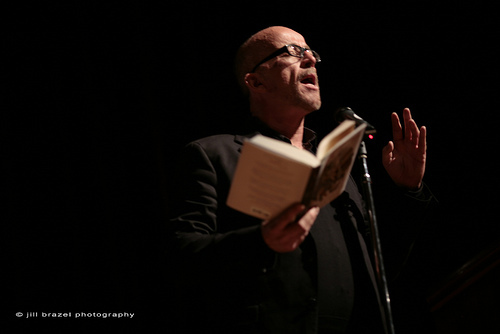 2008 Featured Poet Mark Doty reads at the 2008 Split This Rock Poetry Festival. From A Darker, Sweeter String, Off the Grid Press, 2008. Used by permission. Lee Sharkey is the author most recently of A Darker Sweeter String (Off the Grid Press), of which Maine's Poet Laureate Betsy Sholl says, "If our dreams could edit the news (and sometimes our nightmares) these poems are how they'd wake us up to the urgency of our times." She is also the author of the book-length poem farmwife and To A Vanished World (both Puckerbrush Press), a poem sequence in response to Roman Vishniac's photographs of Eastern European Jewry in the years just preceding the Nazi Holocaust. She lives in rural Maine, teaches a writing workshop for adults with mental illness, and stands in a weekly peace vigil with Women in Black. She is the co-editor of the Beloit Poetry Journal, which published a chapbook of the work of Split This Rock poets for the first Split This Rock festival. Sharkey appeared on the panel What Makes Effective Political Poetry? Editors' Perspectives during Split This Rock Poetry Festival: Poems of Provocation & Witness 2010. Kyndall Brown, a freshman at Duke Ellington High School was awarded First Place in the Larry Neal Writers' Award competition for Teen Poetry. Split This Rock is incredibly proud of Kyndall, who has been a part of the Split This Rock family since 2006 when her poem “When Is War Going to Stop?” was published in the special Wartime Issue of Beltway Poetry Quarterly. Deanna Nikaido and Andrea Carter Brown at the 2008 Cento. Lita Hooper is a poet, playwright and educator. Her work has appeared in several anthologies, including Crux: Conversations in Words and Images from South Africa to South USA (2008) and Tempu Tumpu/walking Naked: African Women’s Poetic Self-portrait (2009). 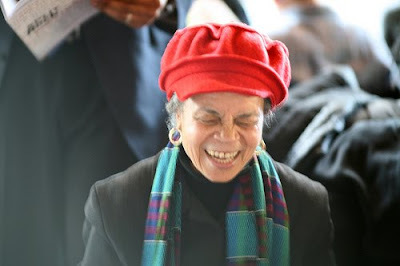 She is the author of two chapbooks, Legacy and Perspectives, and a critical biography, Art of Work: The Art and Work of Haki Madhubuti (2006) Her work has also been published in online and print journals and magazines, including poetrymidwest, Drumvoices Revue, Essence, The Drunken Boat, Reverie, and Pluck! Ms. Hooper's collection of poems, Thunder in Her Voice: The Journal of Sojourner Truth, was recently published by Willow Books (2010). Hooper appeared on the Willow Books Reading panel during Split This Rock Poetry Festival: Poems of Provocation & Witness 2010. 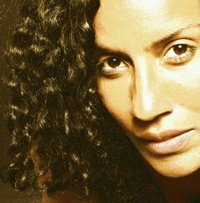 Aracelis Girmay is the author of the poetry collection Teeth, for which she was named a Pan African Literary Fellow & recipient of the GLCA New Writers Award. Girmay's work has also been published in Callaloo, Ploughshares, & MiPoesias, among other journals. She teaches in Drew University's low-residency MFA program, DreamYard's Bronx Poetry Project, & will begin teaching at Hampshire College in September. Among the poets whose work is deeply teaching her are: Forugh Farrokhzad, Gwendolyn Brooks, Martín Espada, Nazim Hikmet, & Lucille Clifton. David Gewanter is author of three books of poetry: In the Belly (1997), The Sleep of Reason (2003), and War Bird (Fall 2009) all published by the University of Chicago Press. His work appears in Threepenny Review, Poetry Magazine, Boston Review, TriQuarterly, New England Review, Fulcrum, Kenyon Review, Ploughshares, Tikkun, Slate.com, Harvard Review, PoetryMagazine.com, Crossroads, Boston Globe, Semicerchio (Italy), PMLA, and elsewhere. He is the recipient of a Witter Bynner fellowship, a Whiting Foundation Writer's award, and a Hopwood award. He teaches at Georgetown University and lives in DC. In this workshop, we will explore risk, metaphor, & vision in relation to the praise poem. Through a series of generative prompts & questions, we will explore the ways in which the act of practicing metaphors might teach us something essential about personal history, empathy, action, and memory. Please contact Sarah at browning at splitthisrock dot org for more info. 2008 Featured Poet Sonia Sanchez laughs at the 2008 Opening Ceremonies at Busboys and Poets. We destroy each other too. On Thursday, April 29, 2010, a “Teach-In on Capitol Hill,” was held in Room 2168 of the Rayburn House Building , in Washington, D.C. , dealing with the question of what the U.S. Congress must do to end the U.S. Wars and secure a peaceful Middle East . Rep. Dennis J. Kucinich (D-OH) served as the Moderator. On the panel were: David Swanson, Chris Hedges, Ann Wright, Jeremy Scahill and Josh Stieber. Joseph Ross is a poet, working in Washington, D.C., whose poems have been published in many journals and anthologies including Poetic Voices Without Borders 1 and 2, Poet Lore, Beltway Poetry Quarterly, and Full Moon on K Street. He co-edited Cut Loose the Body: An Anthology of Poems on Torture and Fernando Botero’s Abu Ghraib for D.C. Poets Against the War. He has given readings in Washington, D.C.’s Miller Cabin Poetry Series and in the Library of Congress’ Poetry-at-Noon Series. He teaches in the College Writing Program at American University in Washington, D.C.
Ross appeared on the panel Gay and Lesbian Poetry in the 40th Year Since Stonewall: History, Craft, Equality during Split This Rock Poetry Festival: Poems of Provocation & Witness 2010.